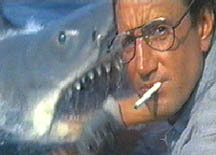 Upon its release in the summer of 1975, Steven Spielberg's JAWS became a pop-culture phenomenon...a true "event" movie. Based on the novel by Peter Benchley, it was the highest grossing picture up to that time - and inspired everything from lunchboxes and toys, to t-shirts and novelty records. As Hitchcock had done with PSYCHO, Spielberg took an ordinary setting (the beach) and made it terrifying. A shark was a "monster" that was most certainly real...and JAWS had an impact on the public consciousness that exists to this day. The setting is Amity, a resort town on Long Island. A group of teenagers are sitting around a beach campfire...when two of them decide to go off together. They've been drinking and the guy chases Chrissie (Susan Backlinie) as both strip their clothes off. The dude is too drunk to make it to the water - but Chrissie does and she swims far out into the ocean. She suddenly feels a tug on her leg and she struggles...but she is no match for whatever is under the water. The male friend is unaware of what just occured, having passed out on the sand. Police Chief Martin Brody (Roy Sheider) lives with his wife Ellen (Lorraine Gary) and their sons Michael (Chris Rebello) and Sean (Jay Mello). He gets a call the next day notifying him that the girl is missing. While searching for Chrissie on the beach, he and another officer find her severed arm...partially buried under the sand. The medical examiner confirms that it was a shark attack. Chief Brody is now poised to make the unpopular decision to close the beaches. Mayor Vaughn (Murray Hamilton) becomes concerned about bad publicity coinciding with the upcoming Fourth of July festivities. He tries to convince Brody that the girl's death was due to a boating accident. The still open beach is packed. Mrs. Kinter (Lee Fierro) watches as her little son Alex (Jeffrey Voorhees) goes into the water with an inflatable mattress. Chief Brody is there and he's on edge because of what occured the previous night. Suddenly, he sees a commotion...as the shark attacks the boy and everyone rushes out of the water. The mattress...deflated and bloodied...washes up on shore. The Mayor holds a meeting with the townspeople and tells them the beaches are going to be closed. But people are upset because their businesses will be hurt. 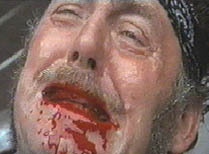 An out-of-towner is present, a crusty seafarer named Quint (Robert Shaw) and he volunteers to catch and kill the shark. His asking price is $10,000. "For that - you get the head, the tail, the whole damn thing," he says. Mayor Vaughn thanks him for his offer and tells him it will be considered. Chief Brody starts researching the subject of sharks. Ellen tries to calm him down but when she points out that Michael is sitting in docked boat, Brody yells at the boy to get out of the water. Ellen doesn't understand what the big deal is until she sees an illustrated picture of a shark attack in a book. "Michael, did you hear your father...out of the water now!" she screams. Two fisherman, Charlie (Robert Chambers) and Posner (Cyprian R. Dube) - are on a dock. Something grabs their bait and begins pulling it. The force is so great, the wooden dock breaks and Charlie falls into the water. Fortunately, he is able to swim back to the shore before being harmed. The locals begin their own hunt for the shark and are joined by people from neighboring states. Matt Hooper (Richard Dreyfuss), from the Oceanographic Institutue, arrives to investigate. He meets with Brody and asks to see the remains of the first girl who was killed. The cause of death is listed as "probable boating accident" but when Matt takes a look at her remains...he can clearly see it was something else. Not only is there a shark in the waters - but it is larger than usual, he tells the Chief. A shark is captured and folks are relieved that their worries are over. Matt takes one look at it and is not so sure. The bite radius is different than the wounds on the female victim. He asks to have the shark cut open to confirm this but Mayor Vaughn is reluctant to do so. Dressed in mourning black, Mrs. Kinter walks up to Chief Brody and smacks him. "I just found out that a girl got killed here last week and you knew it. You knew there was a shark out there but you let people go swimming anyway," she tells him. She accuses Brody of being responsible for Alex's death, a charge that stings him. Matt joins the Brodys for dinner at their home. His visit breaks the tension between the couple. But Ellen gets upset when their guest tells them the killer shark is still on the loose. A bottle of wine is opened and Brody says he and Matt will open the captured shark that evening. When they do, they find a variety of things in its stomach: a few fish, a can and a license plate. Now convinced this is not the shark they're looking for, Chief Brody and Matt take a boat out into the water. They discover an abandoned boat belonging to a fisherman named Ben Gardner. 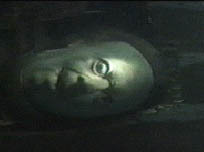 Matt goes underwater to investigate and in an opening under the boat, he's frightened by the sudden appearance of Ben's corpse. The two men try to convince Mayor Vaughn to close the beaches. They tell him about the Gardner boat - and also about a tooth that Matt found which belongs to a Great White, which he unfortunately dropped. The mayor is unmoved. The next day is the 4th of July and he is not going to let anything stop the celebration. People are arriving left and right. The beaches are packed with tourists and law enforcement officials. Mayor Vaughn is concerned that people are avoiding the water and convinces a friend to take his family in. Others follow but Chief Brody prefers that Michael take his boat into the nearby pond instead. Panic soon grips the beachgoers as a shark is detected...but it turns out to be two young boys playing a practical joke. A real threat is actually in the water nearby. A girl sees a shark in the pond and yells out for help. Realizing that his two kids are in the area, Brody runs over to get to them. The shark overturns a boat and attacks one man, biting his leg off. Michael is in shock and cannot move. Good thing too... because the Great White doesn't harm him. The boy is rushed to the hospital and Mayor Vaughn visits. 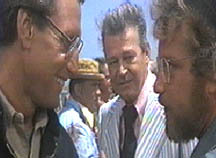 Chief Brody convinces him to sign the paper authorizing Quint to hunt for the shark. Both Brody and Matt insist on joining Quint on his boat called The Orca. Ellen sees her husband off at the dock, upset and concerned about his safety. It's smooth sailing at first - although Chief Brody is nervous. On their first day out at sea, the men feel a tug on their line. It's nothing...but while Brody is dropping fish in the water as bait, the Great White appears. "You're gonna need a bigger boat," he yells to Quint. Quint shoots the beast with a harpoon, attached to a barrel for indentification. But the shark gets away. By nightfall, there have been no sightings and the men relax in the cabin, showing off their scars and listening to Quint's experiences. The shark shows up again and does damage to the boat. It comes back the following moring and is becoming more aggressive. When Brody tries to radio for help, Quint smashes the equipment...determined to capture his prey by himself. Quint fires two more harpoons at the shark and the Great White nearly brings the Orca under. 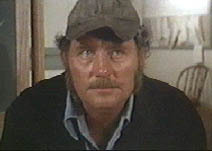 As the boat starts to fill with water, Quint drives it further out to sea. Matt hopes to calm the shark by injecting it with a drug. He is lowered underwater in a cage so he can get close to it. The shark immediately comes towards him and smashes the cage. Matt narrowly escapes and hides behind a rock. When the cage is raised back up, Quint and Brody believe they've lost Matt. The shark leaps up on deck and half of the boat goes down. Quint is unable to grasp onto anything and slides into its mouth. The shark devours him and Chief Brody now thinks he's the sole survivor. He manages to toss a flammable cannister into the shark's mouth and finally defeats it with a precise rifle shot...which makes the Great White explode. Matt emerges from the water and the two swim back to shore by grabbing onto a couple of barrels. Not only was JAWS a tremendous career boost for Steven Spielberg, it also catupulted composer John Williams into the forefront of film scoring. It was perhaps the most famous and effective instrumental music used in a motion picture since, well...Bernard Hermann's score for PSYCHO some twenty five years earlier. Spielberg was saddled with a mechanical shark that refused to work properly on most days. That malfunctioning was a gift - for it forced the director to come up with creative ways to convey tension and fear without actually showing the Great White for most of the action. The success of this picture lead to a subgenre of underwater thrillers, most of them not nearly as good. They include Orca: The Killer Whale, Pirahna and Tentacles. An adaptation of Peter Benchley's The Deep in 1977 was an attempt to cash in on the craze...but became more notable for Jacqueline Bisset's assets than anything else. In addition to being a great monster movie, JAWS is really a good story...with classic ideas of man versus nature. The old seafarer is old Hemingway. A strong and timeless movie.